The Museum of Applied Arts in Budapest (IMM) is organizing the Art Nouveau World Day in 2013 in cooperation with Szecessziós Magazin (Art Nouveau Magazine). The date selected is June 10, the anniversary of both Antonio Gaudi and Ödön Lechner – two charismatic architects of the movement, from two edges of the Europe. 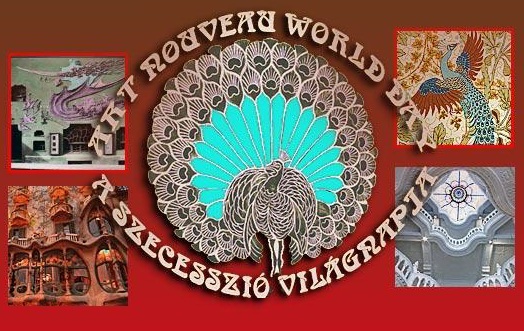 Most events organized in connection with the Art Nouveau World Day will take place on the weekend before this date, on June 8-9th. The World Day is organized in connection with the Partage Plus project, which is a European project aimed at digitizing Art Nouveau objects. The Art Nouveau movement, its community-building effort and the totality of its ideas sets an example for us in the 21st century as well. Therefore, we invite you to participate in the Art Nouveau World Day, with lectures, presentations, performances, exhibitions, guided tours and publications. We welcome all joining participants to the programme. Click here to download the Art Nouveau World Day flyer!